May 4 is National Candied Orange Peel Day. You might not be familiar with this type of candy, unless you're a baker or confectioner. Today is a perfect day to find out what is candied orange peel. Candied orange peel is widely used by bakers and confectioners around the world. They add it in cookies and fruitcakes to enrich dough with orange flavor and additional sweetness. However candied orange peels can be eaten by themselves. What is actually candied orange peel? 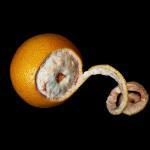 This is peel that you throw away when you eat oranges. If it undergoes the processes of boiling in sugar and drying, it becomes very sweet, but preserves its distinct orange flavor. We think that National Candied Orange Peel Day is the best day for you to make your own candied peels. By the way, you can use any kind of citrus peels: lemons, grapefruits and even limes are perfect for the candies. You can make your homemade candied peels even better if you dip them in chocolate. But remember, that peels should be already done before you add a chocolate layer.